We are now taking bookings for this qualification which will be available from 1/7/18. The City & Guilds 2382-18 18th Edition Course at The Builder Training Centre is aimed at practicing electricians with relevant experience and other allied professionals, and those wishing to demonstrate an understanding of the IET 18th Edition Wiring Regulations, including Domestic Installers and Qualified Supervisors whose work falls under the scope of Building Regulations Approved Document P. The current 17th Edition 2382-15 is a nationally recognised minimum qualification for most companies looking to recruit electrical personnel. Both the 2382-15 and 2382-18 will be available until 31/12/18, after which only the 18th Edition 2382-18 will be available. ‘Richard has broken 560 pages down into easily navigated text. The Builder Training Centre (The BTC) offers a high quality structured 2382-18 18th Edition Course which can be attended as one of the following: Weekdays – 3 consecutive days eg Monday – Wednesday, Extended Weekend – 3 consecutive days eg Friday – Sunday, Evening Classes – 6 evenings (including exam) eg Monday and Thursday evenings over 3 weeks. Our instructors are qualified, highly experienced, knowledgeable and enthusiastic Tradespersons, so students can take full advantage of all the tips of the trade, personal experiences and practical advice they offer. This short theory course is intensive, but no compromise is made on the course content. The atmosphere is relaxed and enjoyable which creates a good learning environment. 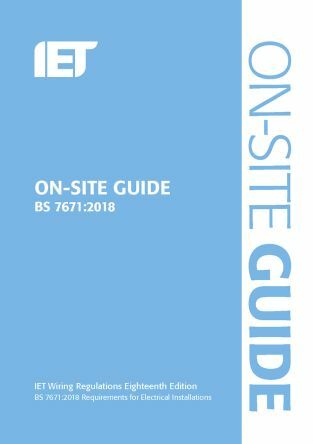 This City & Guilds 18th Edition 2382-18 electrical course is intended to ensure that all students are fully conversant with the IET Wiring Regulations, as recognised by the British Standards Institute, BS 7671, concerning the safe use and operation of electrical equipment and systems. The 18th Edition training course covers areas such as design, construction, inspection, testing and guidelines for achieving electrical safety. 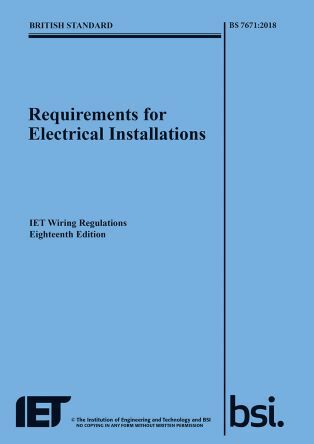 Please note that the content above may vary once the latest (blue) Wiring Regulations book is available. The above books can be purchased from The Builder Training Centre. Which qualification does this replace? Level 3 Award in Requirements for Electrical Installations BS7671: June 2008 2382-15 incorporating Amendment No 3:2015 . Please take time to view a selection of our testimonials from students that have attended the City & Guilds 2382 18th Edition Course by clicking here For health and safety reasons you are required to have steel toe capped footwear to wear throughout the course. These can be purchased from our reception on your first morning for £20 if required. Full payment or a deposit of £200 is required to book a City & Guilds 2382-18 18th Edition Course. Any remaining balance can then be paid at any time before the start of the course, including the first morning. All prices include vat and registrations fees. What opportunities are there on Completion? You are welcome to visit The Builder Training Centre at any time during opening hours (8.00 am until 5.30 pm) either during the week or at weekends to see our facilities first hand. No appointment is required and you will be made very welcome. Why not come and meet our electrical instructors and speak to our electrical students and see for yourself what you can achieve from each course?